No-mess, easy control, fast-drying, non-dripping paint Markers. Great for personalizing & decorating on plastic, glass, ceramic, metal and more. Oil-Based, Permanent, Light-fast, Waterproof and Opaque in a fun range of colors. 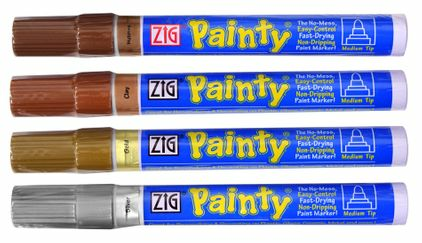 The Zig Painty line has been discontinued.. Get 'em while ya can! !